The Ethiopia Hambela Buku was carefully roasted for you by Onyx Coffee Lab. This fully washed coffee was grown by the Michael Adinew in the Guji region of Ethiopia between 1,800 - 1,950 meters above sea level. We love this coffee for its nuanced notes of chocolate with a range of fruit notes from berries, to tropical fruit to citrus. These beans were delicious, very fruity without being sour. Really enjoy this roaster! Fruit forward (lime and berry), floral aroma and honey-like sweetness for the body. Good balanced light coffee but needed just a bit more flavor to make it stand out. The flavors of the Ethiopia Hambela Buku were a bit too subdued for my palate; Though very drinkable, I prefer a little less subtlety. I found myself experimenting with the grind level daily, attempting to extract a little more out of it. Tools: Capresso Infinity + Chemex. This was pretty good. Actually we got a lot of green bean flavor. We did not get any citrus or tropical fruit. Orange citrus with a tea-like body. A bit underdeveloped in my opinion. Very solid coffee, easy to drink. Lots of people like it. I prefer slightly fruitier. Tried in single pour over, french press and chemex - chemex was my favorite. Fantastic! Enjoyed this coffee to the last drop, especially in a chemex. Pleasantly surprised every single time! Not terribly fruit forward and I prefer natural process for Ethiopian coffees. Definitely complex. Light fruity and chocolate flavors as well as subtle lemon flavor. Really tasty coffee! I love light roasts because I feel like I can get a lot of flavors from french pressing. I could really taste the chocolate and it was certainly a full-bodied complex flavor. Maybe for my next shipment I could use something just a tad darker, with some notes of fruity flavors. I don't have much to compare it to, but I really like it. It's a little earthy on the front end, not too much which is good for me. I really like the bright notes that resemble more of a citrus. The citrus flavors appeal to me the most at the moment, but I am a rookie at the moment. Learning my coffee, my chemed, and the coarseness of the grind. Thanks so much. I enjoyed this coffee very much! I found this one to be particularly delicious in the aeropress! Love the fruity and citrusy aspects of this coffee. I would say this coffee would end up being my go-to if it were quick and easy to get! Hey Connor, I really apologize for how long it's taken me to get around to reviewing this one! I've been traveling nonstop, but I've been carrying this with my french press and chemex. I had always wanted to try a very light roast coffee, so it was really nice to be able to try this one out. Is it a peaberry? The beans are so small! Anyways, this one really surprised me because it truly does resemble a tea when brewed in a french press: very light and subtle, with almost woody and grassy notes. French press tends to lend a more robust body to a coffee, but this one maintained a light, dare I say weak, body even when brewed in the press. I definitely appreciate you sending this one along because it finally sated my curiosity for extremely light roasts, and now I understand the rationale for roasting just a touch darker. After sifting through so many coffees, I know you must have a very particular and refined taste. I'm not afraid to try anything new, so for this next round, I'd love try one of your personal favorite coffees/roasts, and I'd also like to prepare it using your personal favorite brew method and coffee-to-water ratio. Thanks so much, Connor. You're doing great, and I'm looking forward to this next one! Loved the wideness in this bean's flavor notes. Great amount of body but wasn't milky or creamy in its consistency, at all. Lovely pick. Had a wonderful complex and sour flavor! This coffee is one of the best Hambelas I've had all year. Even better than a natural I had very recently from another roaster. Very complex. Lime, bergamont, little bit of chocolatey and even some distinct dark berry notes. Even better as it cools. Nice and citrusy right off the first sip. Brewed it on Kalita Wave 185 with the "perfect water" recipe. You will not be disappointed with this delicious coffee. In the Aeropress, it was much more fruity, specifically cherry. Still a little weak. Made in a metal filter pour over, which is my preferred method. It was a little weak, though, so I'm gonna play with ratios and try the Aeropress. Other than that, It was super citrus-y, not orange, but more lime, like the tasting notes said. When I put it in my mouth, it tingled similarly to citrus, so that was a cool sensation. The roast level was perfect for my taste. Some reviews mention that the flavors are muted or thin, which I could see if you're using a pourover. I typically let mine brew in an Aeropress for 2-3 minutes to let the flavors develop. Definitely not a bold or heavy coffee! I didn't get any citrus, but still enjoyed this freshly roasted batch. We found the flavor profile to be quite accurate and enjoyed it on the Aeropress, Hario Woodneck, and the Kalita Wave. loved the juicyness... and the milk chocolate added a fun complexity to the cup! The Woodneck made the mouthfeel buttery, and brought it to another level that we liked. This coffee was amazing. Wish I had gotten even more to continue enjoying. Very sweet coffee, I would prefer a little more earth and nutty notes, but not too earthy. I found this coffee very sweet and fruity. This coffee was a little to thin and lite for my tastes. I had used a chemex and later french press to brew, but felt it was lacking body compared to what I like. I brewed these maybe seven times so far using two the Aeropress (using a couple recipes in the Aeropress Timer App) and the Hario V60. I can get a sense of the flavors that are described here (chocolate, fruity, complex), but didn't fall in love with any of the cups. It was good, but it wasn't great. I really enjoy the floral and citrus notes of the coffee. I've brewed it on a V60 and on a Kalita wave and noticed with both methods that this coffee, like many Ethiopians I have sampled, is the most flavorful 10-15 minutes after initially brewing. The only star I'm taking off for this coffee is that when hot (just after brewing), it tastes thin and lacking in complexity. Really great coffee. I mainly used a Chemex with this coffee and the outcome has been great. A smooth tasting coffee with hints of fruits notes in its after taste. 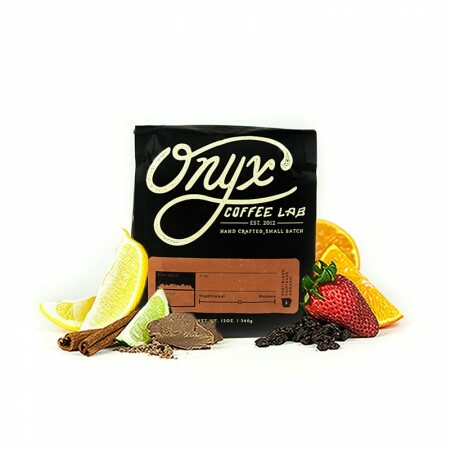 I really enjoyed this coffee from Onyx Coffee Lab. Had trouble distinguishing tasting notes. Was most likely because I was still testing out grind sizes and pour times, don't want that to reflect poorly on the bean. Brewed with Hario v60 and 16:1 ratio. This is a very nice Ethiopian. Strong dark chocolate notes for an Ethiopian with some berry on the finish and nose. When I go to an Ethiopian I tend to want more complex fruit and floral flavors but this was an interesting coffee. The smell of this is amazing. I read the best brewing system is the chemex but I used an aeropress and this is how my experience went. The front end of the taste was a fairly standard, light chocolate notes without much bitterness. Not until I was towards the end of the cup would I taste those fruity notes. There are several variables that could have been the issue. I brewed it too weak, I brewed it too strong, the aeropress or my electronic grinder changed the flavor. I could see the flavor being better as a pour over, I might invest in one in the future. Overall I wish those fruity notes came through stronger and for more of each sip. More of a tangy modern taste similar to Heart Coffee Roasters Ethiopia Aroresa.